After Neon Lights was released, rumours circulated of a limited edition with a remixed version of Homosapien. Whilst this turned out to be a rumour spun by amazon.de , it turned out that Vince Clarke had remixed the track in question, and Eagle had distributed copies around the clubs. However, Eagle had no plans to release a second Neon Lights single, and were now firmly focused on the forthcoming Cry album. In a surprising turn, a second single was announced, but it wasn’t being released through Eagle. 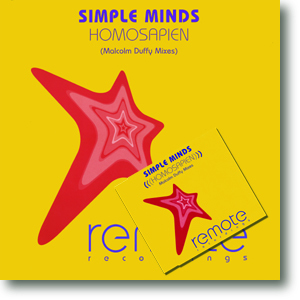 Obviously mindful of the criticisms levelled against the Neapolis singles (all hard-core remixes and no real bonus material), Simple Minds had not signed an exclusive deal with Eagle; whilst mainstream material would be released through their main record label, remixes and reworkings could be issued through specialist dance labels. This would gain extra kudos with the hip dance crowd, whilst keeping their existing fans happy with traditional B-sides on their more visible releases. Hence Malcolm Duffy’s hard club reworkings of Homosapien appeared through Remote Recordings.
" From a band that needs no introduction comes this awesome track with mixes from a man many regard as one of the Lords of the Underground. " And it worked in a limited fashion. Remote distributed a number of 12" acetates which were then picked up by various DJs, and even had Pete Tong giving it Radio One play. Everyone thought it was a bootleg, which gave it extra mystery, unaware that it was all commissioned by Simple Minds’ management. The commercial release was a white-label DJ-friendly 12” and a more fan-friendly CD.
" Malcolm Duffy turns in what is most probably his finest production to date, which is set to devastate club dance floors across the land and beyond. " The single was available through dance stockists, on-line DJ companies and directly via mail order from Remote Recordings. If you ordered through Remote, you got the single a week before its official release. Like Dancing Barefoot EP, it wasn’t expected to set the charts on fire. But it got Simple Minds back into the clubs, back into DJ set-lists and back on Radio One. The formula was set to be repeated with Cry and its attendant remix singles – which would be issued through Absolutely Records. Vince Clarke's remix, which started all the rumours in the first place, finally turned up as a B-side on the Cry single. Several years later, an Eagle CDR surfaced which featured slightly extended versions of Malcolm Duffy's remixes coupled with two remixes by Vince Clarke. It isn't known if this was the copy Eagle had sent to the clubs or an in-house listening copy.